Following a presidential election in which the gender gap was among the widest in recent history, women’s attitudes about prospects for the nation’s future have taken a sharply negative turn. 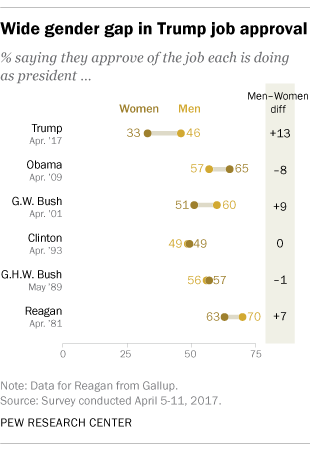 And the gender divide in Donald Trump’s job approval rating is larger than for most recent presidents at comparable points early in their administrations. Men are now much more likely than women to say they have “quite a lot” of confidence in the future of the United States, according to an April survey by Pew Research Center. About half of men (53%) and just 29% of women say this. In October 2015, comparable shares of men (47%) and women (43%) had quite a lot of confidence in the country’s future. Since then, the share of women expressing this degree of confidence has fallen 14 percentage points, while men’s views have shown less change. In the aftermath of the 2016 election, Republicans overall have become more confident in the nation’s future, while Democrats have become less confident. But there are wider gender divides in both parties than in 2015. Among Republicans and Republican-leaning independents, 72% of men have quite a lot of confidence in the nation’s future, compared with just 44% of women. Two years ago, these differences were far more modest. 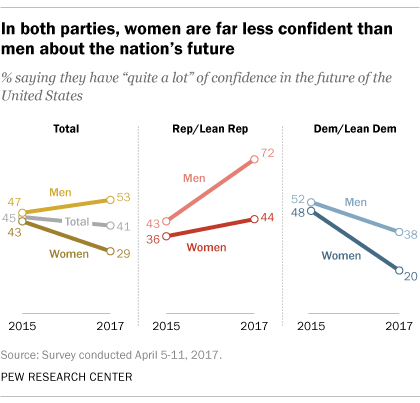 And while Democrats and Democratic leaners – men and women alike – are less likely to express a high degree of confidence than two years ago, the falloff has been particularly striking among Democratic women. Just 20% of Democratic women say they have quite a lot of confidence in the future of the U.S., down from 48% in 2015. And among Democratic men, 38% say this, compared with 52% two years ago. Women also are less likely than men to express satisfaction with the current state of the nation: 23% of women are satisfied with the way things are going in the country today, compared with 36% of men. This marks a change from recent years: During Barack Obama’s presidency, there were more modest gender differences in levels of national satisfaction. The current gender gap in national satisfaction is on par with that of the final years of George W. Bush’s presidency. In early January, women were also less positive about prospects for the coming year than were men – and less optimistic than they had been a year earlier. 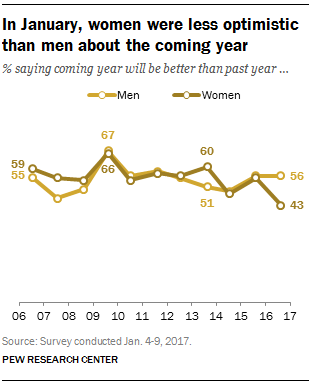 Just 43% of women said they expected 2017 to be a better year than 2016, compared with 56% of men. In January 2016, nearly identical shares of women (55%) and men (56%) said the coming year would be better for them. In last fall’s election, according to the national exit poll conducted by Edison Research for the National Election Pool as reported by CNN, the gender gap was among the widest in elections dating to 1972. Women favored Hillary Clinton by 13 percentage points (54% to 41%), while men supported Trump by about the same margin (53% to 41%).